Voting is underway for the 2018 SSA Elections! Cast your votes for Vice President/President Elect, Secretary, Executive Board members, and for Nominating and Scholarship Committee representatives. Voting ends Thursday April 5 at 11:45 pm Central Time. The Society of Southwest Archivists invites graduate and undergraduate students to submit an abstract for a poster presentation at the 2018 Annual Meeting in San Antonio, Texas, May 23-26, 2018. Posters may describe applied or theoretical research that is completed or underway; discuss interesting archival collections with which students have worked; or report on archives and records projects in which students have participated (e.g., development of finding aids, public outreach, database construction, etc.). Submissions should focus on research or activity conducted within the previous academic year (Fall 2017 - Spring 2018). Poster dimensions: 32 inches by 40 inches (may read vertically or horizontally). Submit your abstract to sallysinor@hotmail.com with “SSA Poster” as your subject line. Students will have the opportunity to discuss their poster with attendees for 30 minutes on Friday May 25 at 3:00 pm in the conference hotel. Easels will be provided. Student poster presenters must register and secure institutional or personal funding to attend the Annual Meeting. Looking for a few good Archivists! As we head into the holiday season, please take a brief moment to think of someone that you would like to nominate for the upcoming positions in SSA for 2018. We know that there are folks out their whose work, leadership, and service you all admire. Self-nominations are also welcomed. Involvement and work in the Archivists of Religious Collections Section (ARCS) of the Society of American Archivists. 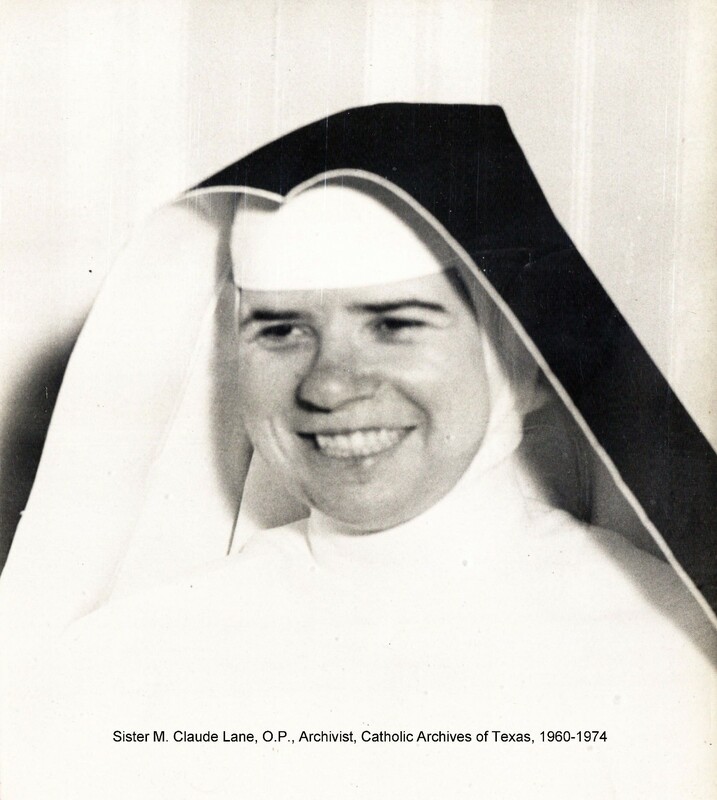 Theresa Angela (Sister M. Claude) Lane (1915-1974) was a teacher, librarian, and archivist primarily associated with the Catholic Archives of Texas. A pioneer and supporter of religious special collections in Texas libraries, she has served as a model for archivists nationwide. The Society of American Archivists presents an annual award in her name to recognize significant contributions in the field of religious archives. The Program Committee invites submissions for 60 or 90-minute sessions for SSA’s next Annual Meeting in San Antonio, Texas May 23-26, 2018, at Hilton Palacio del Rio Hotel. See the Call for Proposals for more information and how to submit. The SSA Board and Diversity Committee support the work of the SAA Council working group and will continue to ensure that the SSA mission to promote sound principles and standards for preserving and administering records in our region is fulfilled. The Society of American Archivists (SAA) Regional Archives Association Consortium, (RAAC) has initiated a sustaining membership in the National Coalition for History,(NCH) gaining a seat on the Policy Board in order to represent archival interests at NCH. As a member of RAAC, SSA made a contribution to the cost of this membership and therefore can connect our members to the NCH. The attached report was issued at the SAA annual meeting and details federal funding approved for granting and records agencies for FY18. SSA Board statement on Texas "Bathroom Bill"
As many of you are aware, the Texas State Legislature has called a special summer session and is considering a bill that would compel some people to use public restrooms that do not correspond to their gender identity. If the bill currently being discussed passes through the Texas legislature, it will prevent municipalities from passing anti-discrimination ordinances designed to protect transgender people. The SSA Board believes that this bill is discriminatory and contrary to the SSA Statement on Diversity and Inclusion (https://societyofsouthwestarchivists.wildapricot.org/SSA-Diversity-Statement). The SSA board issued an official response that is being sent to the governor, lieutenant governor, and speaker of the house stating the organization’s opposition to this piece of legislation. The response also states that should the bill become law, SSA will seriously reconsider holding future annual meetings in Texas. A copy of this letter is available on the SSA website and social media channels, and Texas members of SSA are welcome to use any or all the language contained in the response should they choose to contact their individual representatives. We also wanted to assure membership that we are taking steps to make sure that the next annual meeting, scheduled to be held in San Antonio, TX in May 2018, will be as open, inclusive, and welcoming as possible, regardless of the fate of this legislation. We know that other organizations, such as the Society of American Archivists, are investigating moving future meetings out of the state. It is not possible for SSA to cancel or move the San Antonio meeting at this point. If SSA pulled out of the contract today, it would cost the organization $50,770.40, which is more than double SSA’s entire annual budget. In light of this, SSA will honor the contract and have the meeting as scheduled. Also, with more than half of the SSA membership comprised of archivists in Texas, it is not the intent or desire of SSA to abandon that part of the membership because of the ill-conceived legislation being considered in the Texas Legislature. The Local Arrangements Committee, in cooperation with the Diversity Committee, is already planning alternative arrangements for those SSA members who may be negatively impacted by this legislation. They are also investigating different ideas to foster discussions about how we as individuals and as an organization can respond to discriminatory legislation that may arise in our region in the future. If you have any additional questions or concerns, please feel free to contact the SSA Board through the “Contact” page on the SSA Website. The 2018 SSA Annual Meeting will take place May 23-26, 2018 in San Antonio, Texas at the Hilton Palacio del Rio. The hotel rate will be extended through the 27th for anyone wanting to make it a long weekend. See you in San Antonio! Calling all students! Do you have a research project you'd like to share with other archivists? SSA invites graduate and undergraduate students to submit an abstract for a poster presentation at the 2017 Annual Meeting in Fayetteville, Arkansas May 24 – 27, 2017.